My unplanned foray into crafting on TV has not brought me riches or fame (I don’t get paid to do my segments and Martha still hasn’t called.) but the adventure has payed off in many other ways. It’s forced me to learn how to craft on the fly in front of live audiences and allowed me to meet many talented people who come through the studio. Enter J Schwanke, the flower expert at uBloom.com and host of JTV, an entertaining floral design show on the web. J and I met backstage a few years ago while prepping for our regular segments at WZZM Channel 13’s “Take Five & Company” here in West Michigan. Turns out he’s a rising star in the floral industry and very nice to boot. 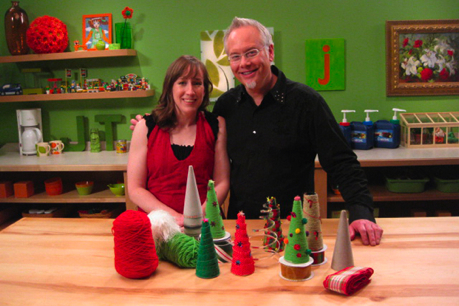 He has kindly invited me on his web show to do craft segments and I always have a great time. Ok, so enough with the back story… head over to JTV to watch our holiday segment and be sure to check out J’s documentary series on California flower growers. You can watch it here. And read on for the directions to make your own wrapped mini Christmas trees. These trees go together fast, so they make for a fun last-minute project for the whole family. 1) Poke the end of your yarn, fabric or ribbon into the top of the cone and use glue or a piece of double sided tape to secure. 2) Begin wrapping and continue until the entire surface of the cone is covered. Feel free to add glue or tape along the way to secure the wrap as you go. 3) When you finish wrapping, cut the end about four inches from the bottom of the cone and use glue or tape to secure the end to the inside of the cone. 1) Poke straight pins through the center of about a dozen pieces of confetti and then poke them into the wrapped cone to look like ornaments. 2) If you want to embellish even more, wrap the cone with floral wire. The embellishment possibilities are endless. Experiment with your favorite yarns, fabrics, ribbons, wires, beads, mini pompoms and whatever else you can think of to make your own collection of one-of-a-kind trees.